Still a great sounding old classic that'll never die. I'm surprised with all of the reissues out there on vinyl that this one hasn't had a recent repress. I'm sure one's on the way. The Albumcover on this Version is NOT a Gatefoldcover . Double LP though. Has anyone heard if a vinyl reissue is coming any time soon?? this relase is from the early 2000's, I don't understand why the original & the reissue are so close in price. I've the same release only the parental advisory logo is still on front. 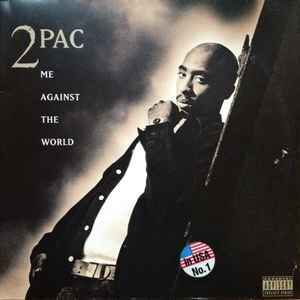 Me Against The World is an album that's different than the albums 2Pac released before this album was released. Me Against The World has a much darker vibe to it than his previous releases. Also there is a clear difference in lyrics. Where before the lyrical themes were about life on the street and stated a critical view on society. On this album the lyrics are more personal and self reflecting. The beats match the atmosphere of the lyrics making this album somewhat "heavier" than what we're used to. This is, however, in no way a bad thing. Not only are there enough really great tracks to make this album worthy to buy but it the entire records stays consistent in quality and in vibe. The album feels as a whole instead of a random collection of songs. Also getting to know the artist in another way and another view makes it easier to relate to the words increasing the impact of the songs. Me Against The World therefore still is one of my favourite 2Pac Album of all time.